Depending on your citizenship and the type of visa you are applying for, you may also have to pay a visa issuance or “reciprocity” fee. 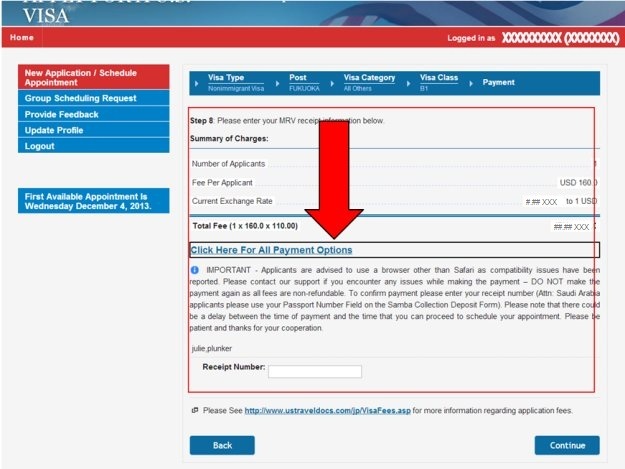 This fee is not an MRV Fee and cannot be used to schedule an appointment. Please make sure that you pay the reciprocity fee in advance only if you are renewing your previous and submitting your application through interview waiver procedure. If you are scheduling your interview appointment, do not pay the reciprocity fee in advance; the fee should be paid at the time of your interview at the Consular Section of U.S. Embassy/Consulate General. You must first register on the applicant site and choose the Schedule Your Appointment option to access the payment option details. See below for the steps. If you are paying for a group of applicants visit the group appointment page. Log-in to our online applicant system and create a profile. This will ensure the proper amount is paid and activated in timely manner. Values are shown in U.S. Dollars (USD); however the Fee payable is in Euros (EUR). This pagehas more information about the different visa application fees. The Euro amounts are based on the consular currency exchange rate determined by the U.S. Department of State. Applicants who do not pay the correct fee for their visa type may be restricted from scheduling an interview. 1. After logging into your profile and while on the payment screen, select the online banking transfer option. Your unique CGI reference number will pop-up on the screen. You will use this number when processing your online payment. 2. Make only one payment per CGI Reference number as the payment is non-refundable. It is critical that you keep the CGI Reference number that you use to make your online bank transfer. You must have this number as proof of payment in order to schedule your visa interview appointment. It is the applicant's responsibility to save this number. 3. Enter your CGI Reference Number in the ‘reference'/reason to transfer/Remitting ID’ field on your online banking funds transfer page. Do not alter the CGI number or include any other information. If you do not include the CGI Reference, your payment will not be recognized. 1.Once you log into your profile and while on the payment screen, you can select to pay using an Debit Card. 2.After you pay the visa application fee, print your receipt for your records.Save your receipt with the transaction number. The transaction number will be used to schedule your appointment. It cannot be replaced if it is lost. You will not be able to schedule an appointment without your transaction number. You may pay your MRV Fee using your online bank account using the Trustly service (Direct Bank Transfer). This payment process can be administered online. 1. After logging into your profile and while on the payment screen, you can select the Trustly payment option and enter your internet banking details. 2. Before your payment is verified, you will receive a CGI Reference Number on screen. Once your payment is verified, you will be redirected to the appointment scheduling page. BE SURE TO KEEP/PRINT your CGI Reference Number. This number is proof of payment and is used to schedule your visa appointment at the Embassy. Your CGI reference number is also available on the statement of payment from your online bank account. Please see the example below. DO NOT close your web browser until a payment confirmation appears. Performing any of these actions may result in multiple payments. Be aware that there may be a delay in the payment being posted to your account. If an error occurs, check your bank account to see if the payment has been collected. 1.After logging into your profile and while on the payment selection screen, you can select the ‘Cash’ payment Option. 2. You will print a deposit slip that will contain a unique CGI reference number which you must include in your cash payment. Please make only one payment per CGI Reference number as the payment is non-refundable. 3. To pay the visa fee take the completed deposit slip to your bank. Include your CGI Reference number in the payment deposit information. If you do not include the CGI Reference number or you do not pay the exact amount indicated on the deposit slip, you will not be able to schedule you appointment. 4.After receiving your payment, the cashier will give you a receipt. Save your receipt as proof of payment. Additional Fees: If you pay this fee at a bank that does not process single euro payment area (SEPA) payments, you may be charged additional fees. If you wish to expedite this transfer, you may be charged an additional fee.